There are approximately 320 unfinished buildings like this dotting the Bangkok landscape. Although memories of the 1997-98 financial crisis are slowly fading, there still remain tangible Bangkok monuments to that difficult time in the form of unfinished high-rise buildings. The Bangkok Metropolitan Administration (BMA) estimates there are over 320 unfinished buildings abandoned by private developers. Construction of these edifices was abruptly terminated when the Thai baht dropped in value. The developers had foreign loans in dollars and when the baht dropped in value, they could not repay their foreign loans and construction had to be stopped. These buildings are scattered throughout the city. Some of the skyscrapers were destined to become office buildings and others, condominiums. Most of them appear gaunt and forlorn sentinels. The buildings are mainly in the Klong Toey, Wattana and Huay Kwang districts of Bangkok. Some are providing homes for people without more permanent homes. Whole communities seem to have developed in a few of these buildings. Not far from the Bangkok Post offices stands one of these structures. 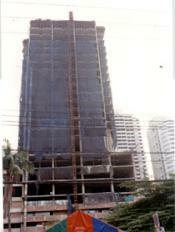 This building was to have become a residential development with a good view of the Chao Phraya River. Now it resembles something one might see in a 1960s science fiction movie about the world after a nuclear war. The feeling is truly eerie and very, very quiet as opposed to other parts of Bangkok. A metal fence was erected around the building. It's slowly rusting but the name of the company that almost built the building is still clearly visible. I researched the company and it still exists. It owes a considerable amount to creditors and last year had difficulty in getting its rehabilitation plan approved. However, it is probably a small miracle that it has survived five years after the 1997 crisis as many companies have folded. In addition to the problems that may stem from people living in these structures, there are other problems associated with the unfinished high-rises. The BMA says that the buildings have become breeding grounds for mosquitoes. Buildings with underground parking facilities are particularly a problem as pools of stagnant water tend to form in the unused parking areas. Kwansung Atibodhi, a lecturer at the Urban and Regional and Planning Department of Chulalongkorn University says the buildings pose numerous risks. Loose construction materials can fall from them at any time he says. Another danger is crime. The Nation reports that Benjawan Suewongprayoona, a senior research manager at Jones Lang LaSalle real estate market research firm, says vacant buildings fall into three categories: those waiting debt restructuring, those that are no longer commercially viable and those with non-performing loan problems. A lot of Bangkokians wonder what will happen to these buildings. The answer to that question is unclear. The BMA does not appear ready to take over the buildings and observers point out that the BMA has a bad track record in regulating construction. So far the BMA's only response has been to set up a committee to help building owners convert their properties for other uses, according to The Nation. In any event, utilising or demolishing these incomplete structures will pose a significant challenge to Bangkok in the future.